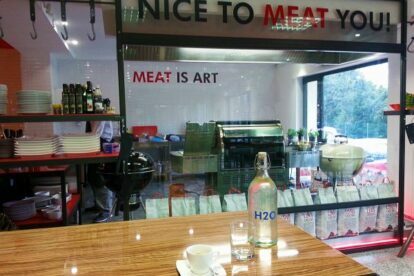 Beef Shop – MEAT me there! „I died and went to heaven!” You probably heard this sentence from somebody describing some phenomenal experience. And that is exactly what happened to me today. I think I can say with that Meat and Grill Boutique became my no. 1 spot in Zagreb! It may be a bold statement, but the place that combines mouth watering beef cuts and great coffee only 10 minutes by foot from my home, I can almost call my second home :-). The main „thing” you will come here for is variety of Wet & Dry Aged assorted meat cuts of famous brands like Austrian Simental, Australian Ocean Beef, Caledonia Scotisch Beef, Irish Beef, Wagyu Morgan Ranch, Wagyu Australia, Wagyu Japan, Hida-Gyu and Black Angus Creek Stone Farm. Conference room and cigar lounge are another nice asset of this great space. You know where my next business meeting will be, don’t you :-)? If you are unable to take a steak or Weber grill with you, there is always a possibility to buy homemade Dalmatian olive oil or mango aceto balsamico. Beef Shop is truly like a candy store for me.